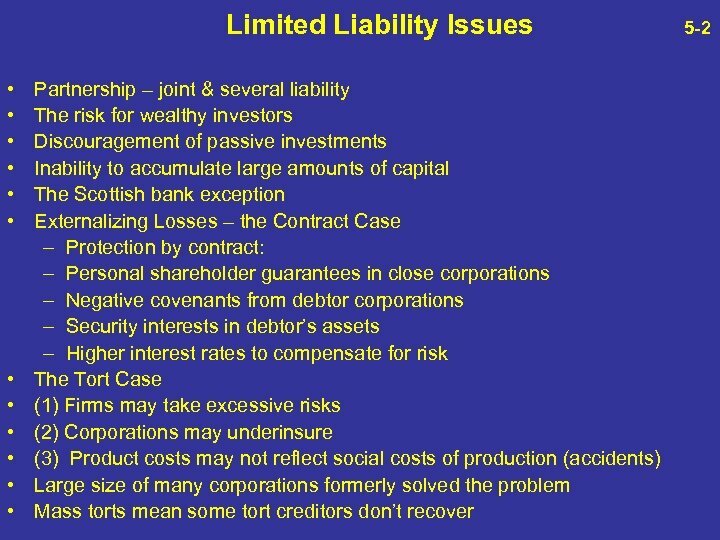 The History of Limited Liability 5 -3 • Joint & several liability existed in Rome, but so did some limited liability. • 12 th & 13 th century – Italian shipping ventures gave limited Liability to passive investors. • The spread of the Limited Partnership form on the Continent. • Corporations, except royally chartered ones, remained like partnerships. • 1855 – England granted limited liability to companies. 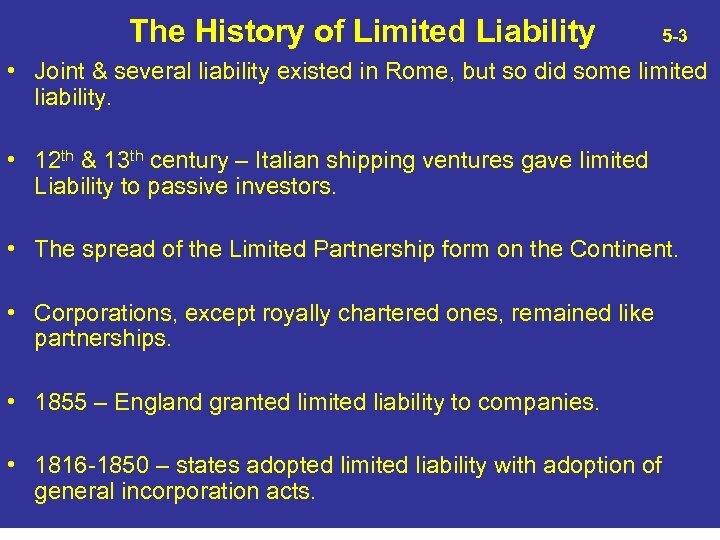 • 1816 -1850 – states adopted limited liability with adoption of general incorporation acts. DGCL 152 5 -5 The consideration. 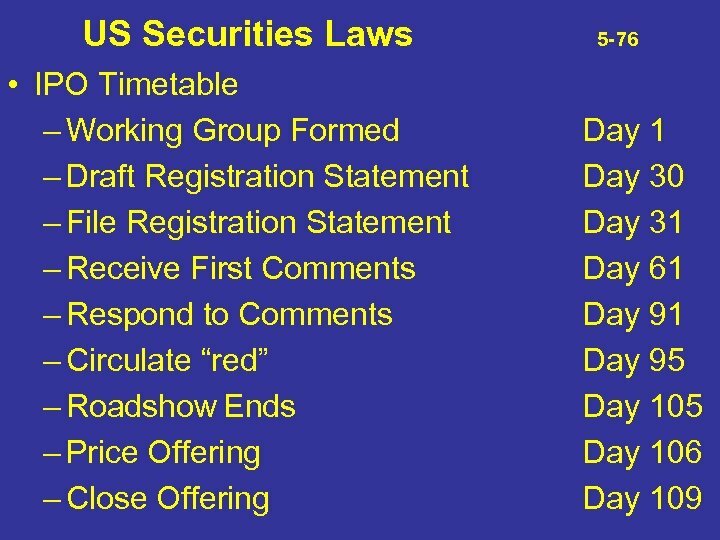 . . for subscriptions to, or the purchase of, the capital stock to be issued by a corporation shall be paid in such form and in such manner as the board of directors shall determine. . In the absence of actual fraud in the transaction, the judgment of the directors as to the value of such consideration shall be conclusive. 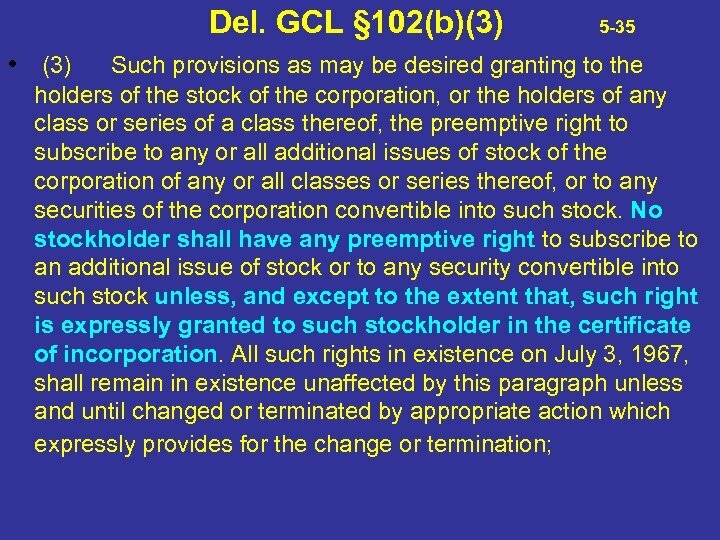 The capital stock so issued shall be deemed to be fully paid and nonassessable stock upon receipt by the corporation of such consideration. .
Penalty Dilution - Option (ii) 5 -9 • Assume, for example, a $1, 000 investment that has gone bad, so that creditors will one-half of the firm’s assets if no new funds are put in. But if an additional $1, 000 is invested, the investment will be worth $1, 750, 000. If 100 original units were sold at $10, 000 each, consider the options: • (ii) 133. 33 new units are offered at $7, 500 each. At the end of the day, 233. 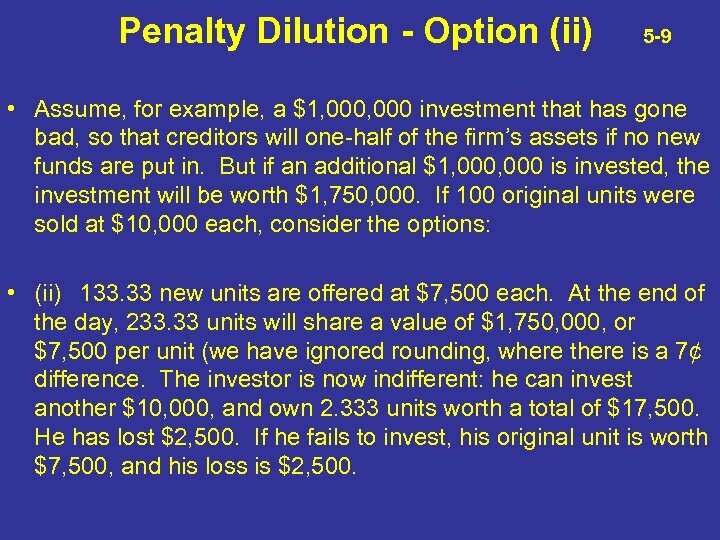 33 units will share a value of $1, 750, 000, or $7, 500 per unit (we have ignored rounding, where there is a 7¢ difference. The investor is now indifferent: he can invest another $10, 000, and own 2. 333 units worth a total of $17, 500. He has lost $2, 500. If he fails to invest, his original unit is worth $7, 500, and his loss is $2, 500. 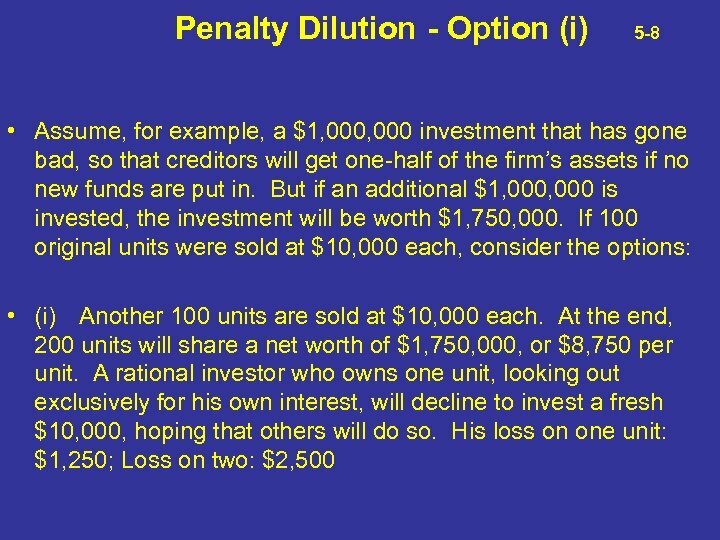 Penalty Dilution - Option (iii) 5 -10 • Assume, for example, a $1, 000 investment that has gone bad, so that creditors will one-half of the firm’s assets if no new funds are put in. But if an additional $1, 000 is invested, the investment will be worth $1, 750, 000. If 100 original units were sold at $10, 000 each, consider the options: • (iii) 200 new units are offered at $5, 000 each. At the end of the day, 300 units will share a value of $1, 750, 000, or $5, 833 per unit. The investor who buys two new units has invested $20, 000 for a total of three units worth $17, 500. He has lost $2, 500. If he fails to invest, his original unit is worth $5, 833, and his loss is $4, 167. 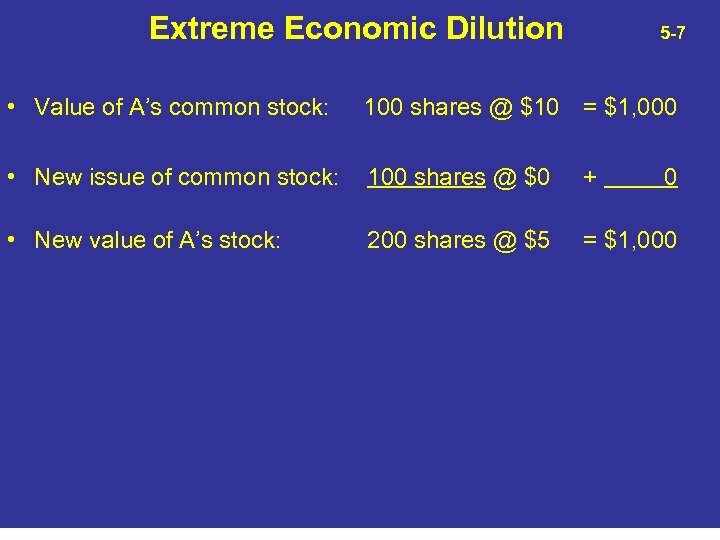 Dilution Equation 5 -11 • L = ma - (mx + p) (a) • x+d • where: L = existing shareholders’ loss through dilution; • m = market price of a share before issuance; • a = a shareholder’s share ownership at the time new shares are issued; • x = shares outstanding before dilutive issuance; • d = number of shares issued in dilutive distribution; • p = proceeds from sale of new shares. 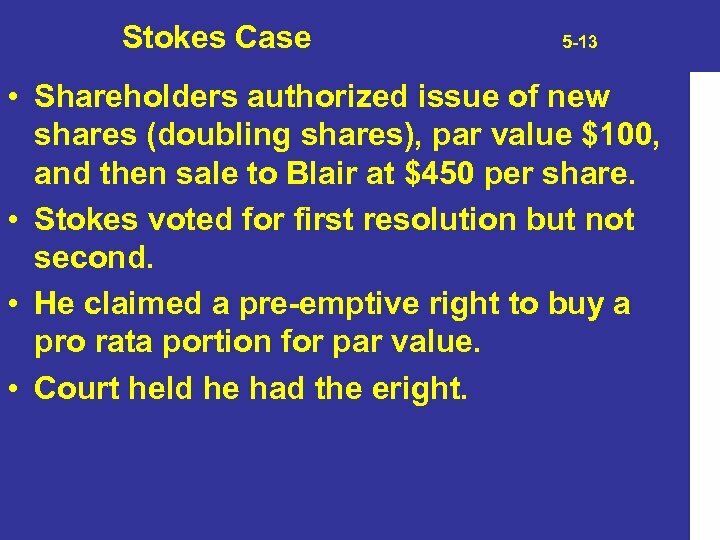 Stokes Case 5 -13 • Shareholders authorized issue of new shares (doubling shares), par value $100, and then sale to Blair at $450 per share. • Stokes voted for first resolution but not second. • He claimed a pre-emptive right to buy a pro rata portion for par value. • Court held he had the eright. Stokes Case 5 -15 1. What business reasons motivated the increase in authorized stock and the sale to Blair & Co. ? • Enlarge the size of the business; • Bring Marshall Field and other merchants into management; • Obtain their banking business. Stokes Case 5 -16 2. Do you have any reason to believe that $450 per share was an unfairly low price for the sale of new shares in Continental Trust Company? Stokes Case 5 -17 2. Do you have any reason to believe that $450 per share was an unfairly low price for the sale of new shares in Continental Trust Company? • Not a self-dealing transaction, at least as reported. • The shareholders approved the sale, presumably by a majority vote. • The Dissent notes stock had never sold for a price this high before. Stokes Case 5 -18 3. 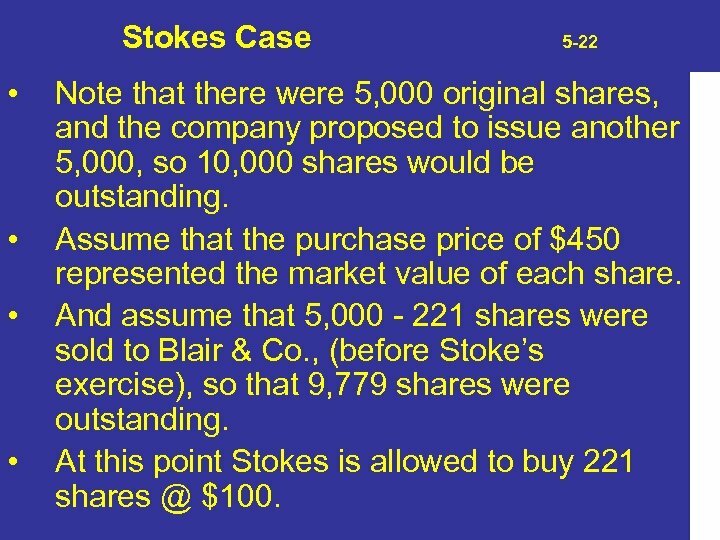 Would it have been fair to other shareholders to allow Stokes to purchase newly issued shares at their par value of $100? Stokes Case 5 -19 3. 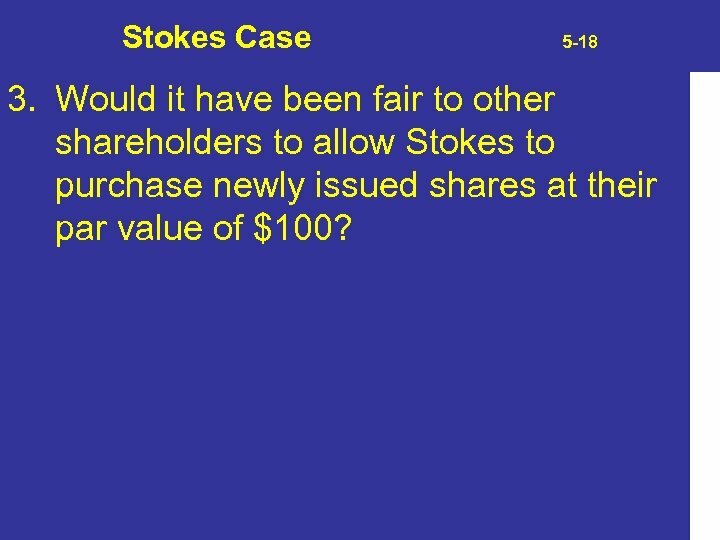 Would it have been fair to other shareholders to allow Stokes to purchase newly issued shares at their par value of $100? • The Dissent points out it would have denied the Company $350 per share. • Second, it defeats purpose of bringing Marshall Field and others into management and getting their banking business. • Note that it would deny Blair effective control, with a 50% block. Dilution Equation 5 -21 • L = ma - (mx + p) (a) • x+d • where: L = existing shareholders’ loss through dilution; • m = market price of a share before issuance; • a = a shareholder’s share ownership at the time new shares are issued; • x = shares outstanding before dilutive issuance; • d = number of shares issued in dilutive distribution; • p = proceeds from sale of new shares. 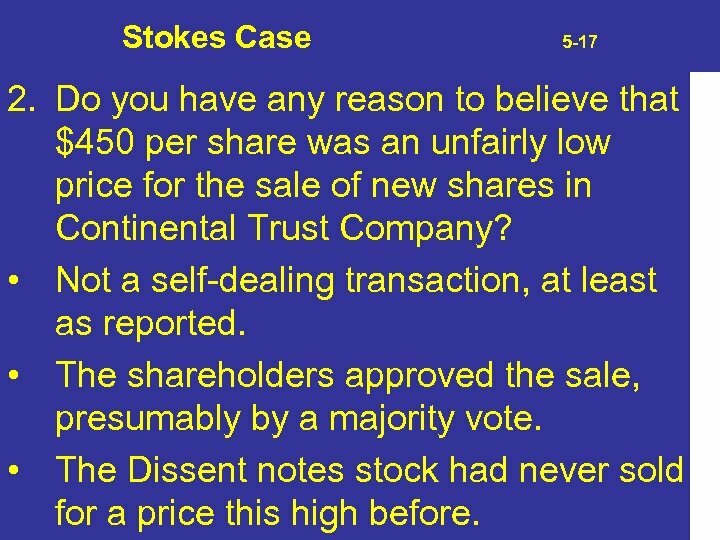 Stokes Case • • 5 -22 Note that there were 5, 000 original shares, and the company proposed to issue another 5, 000, so 10, 000 shares would be outstanding. 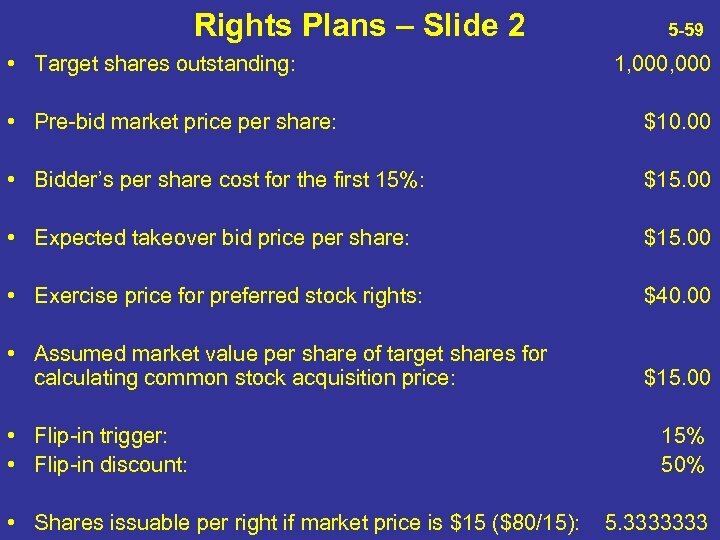 Assume that the purchase price of $450 represented the market value of each share. And assume that 5, 000 - 221 shares were sold to Blair & Co. , (before Stoke’s exercise), so that 9, 779 shares were outstanding. 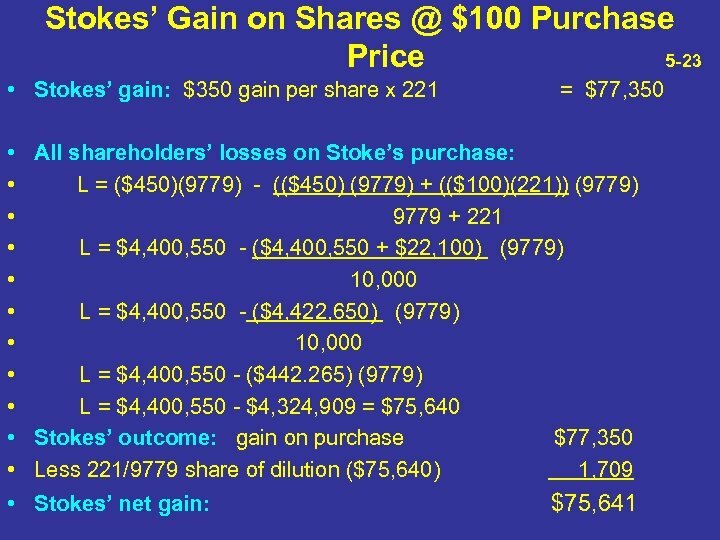 At this point Stokes is allowed to buy 221 shares @ $100. 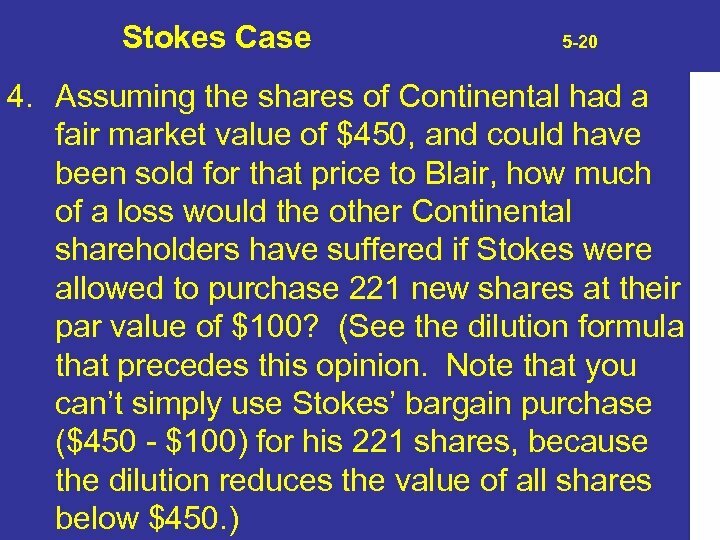 Stokes Case 5 -24 5. 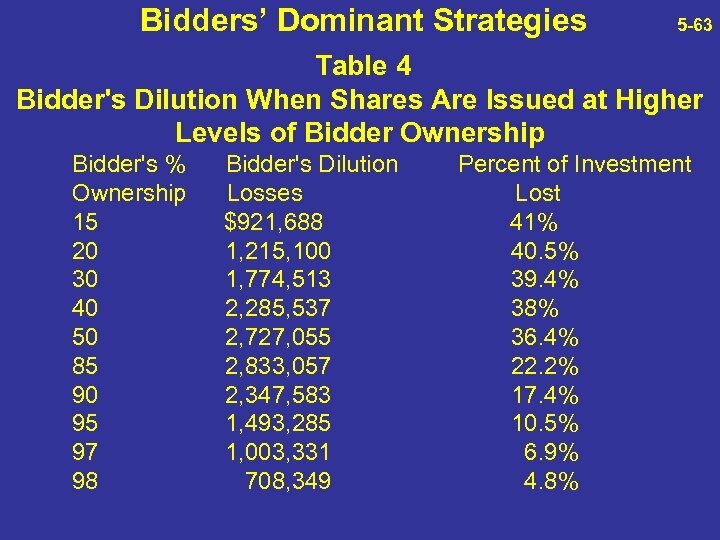 Why would the other shareholders vote to dilute their own share of ownership by selling new shares to Blair at $450? Stokes Case 5 -25 5. Why would the other shareholders vote to dilute their own share of ownership by selling new shares to Blair at $450? • They would not, as a general rule. 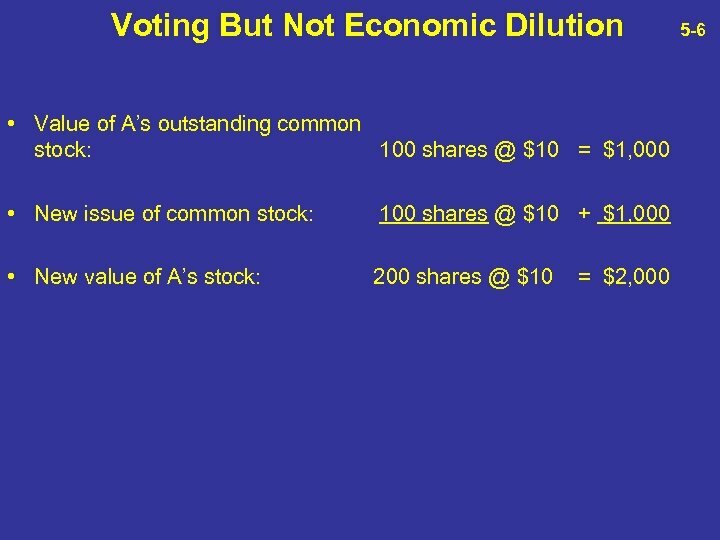 • But this looks like voting dilution, not economic dilution. • That’s the best assurance this is a fair price - a sale to a third party. 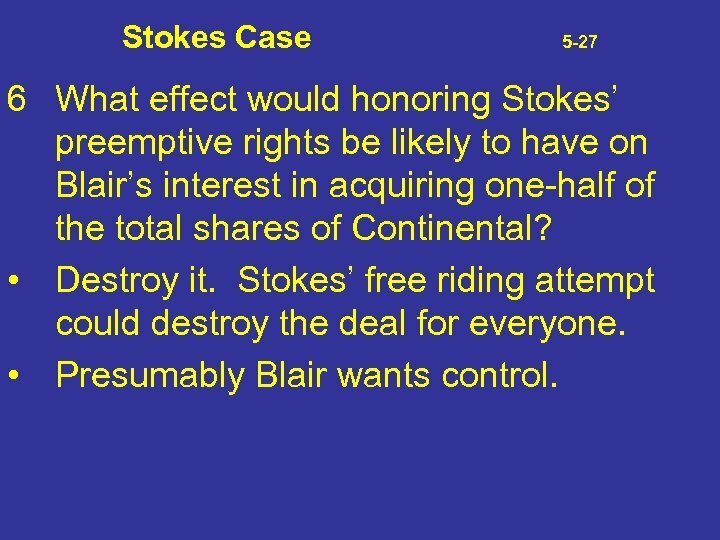 Stokes Case 5 -26 6 What effect would honoring Stokes’ preemptive rights be likely to have on Blair’s interest in acquiring one-half of the total shares of Continental? 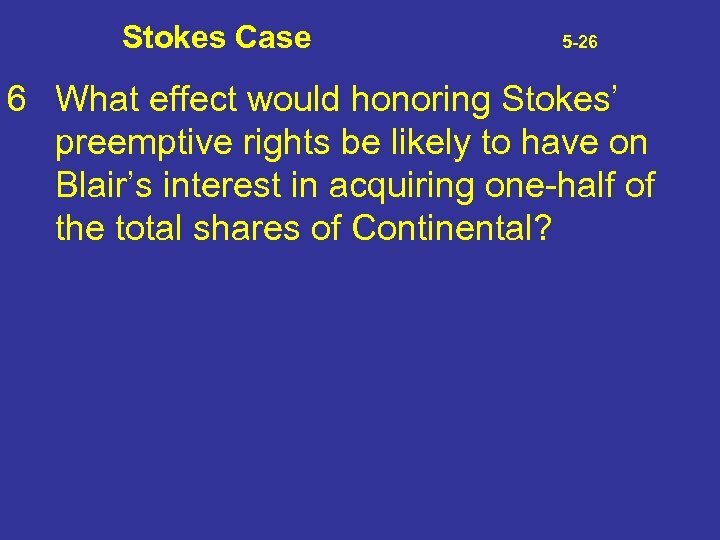 Stokes Case 5 -27 6 What effect would honoring Stokes’ preemptive rights be likely to have on Blair’s interest in acquiring one-half of the total shares of Continental? • Destroy it. Stokes’ free riding attempt could destroy the deal for everyone. • Presumably Blair wants control. Stokes Case 5 -28 7. 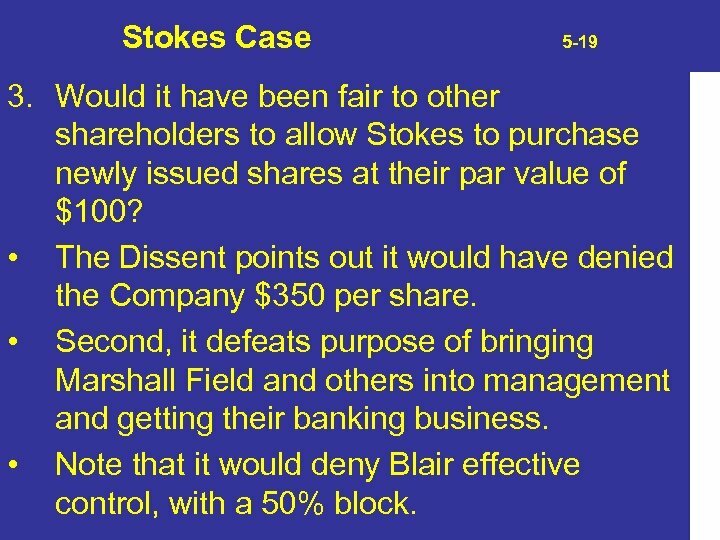 Does the majority opinion suggest any limits on the preemptive rights doctrine that might provide a way for Blair and the other shareholders to avoid Stokes’ claims? If so, how would you suggest restructuring the transaction if you represented Blair or the majority of the shareholders? Stokes Case 5 -29 7. If the sale is other than for cash. The court stated at page 293: – “As the right to increase the stock belonged to them, the stock when increased belonged to them also, as it was issued for money and not for property or for some purpose other than the sale thereof for money. 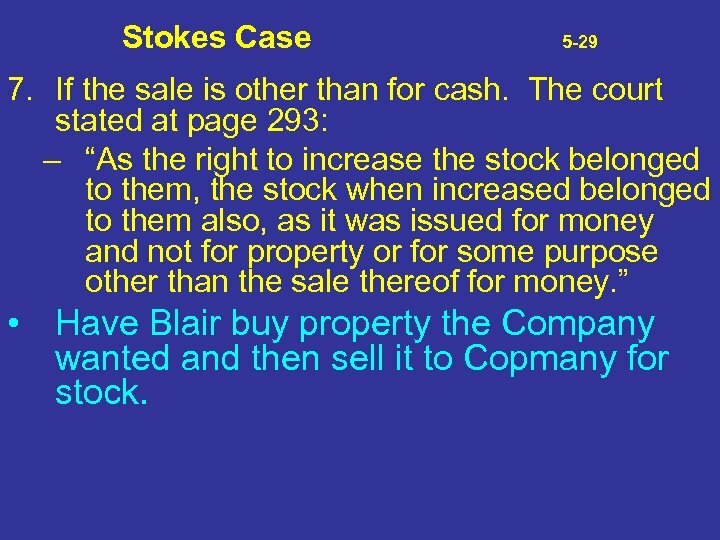 ” • Have Blair buy property the Company wanted and then sell it to Copmany for stock. 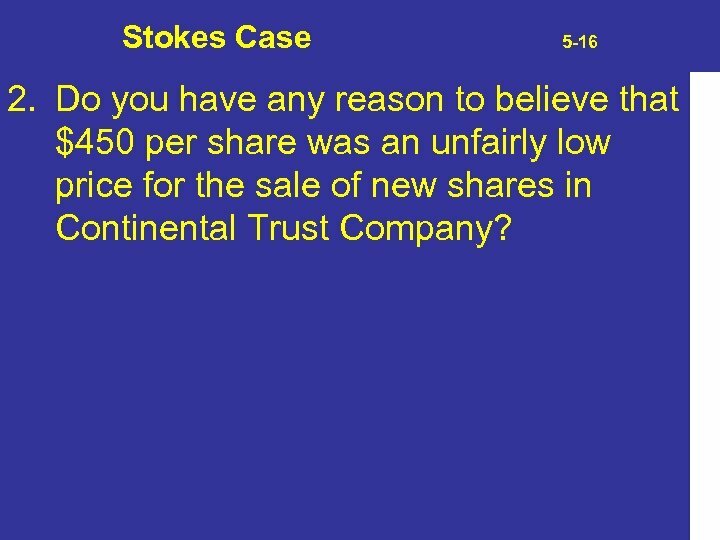 Stokes Case 5 -30 7. 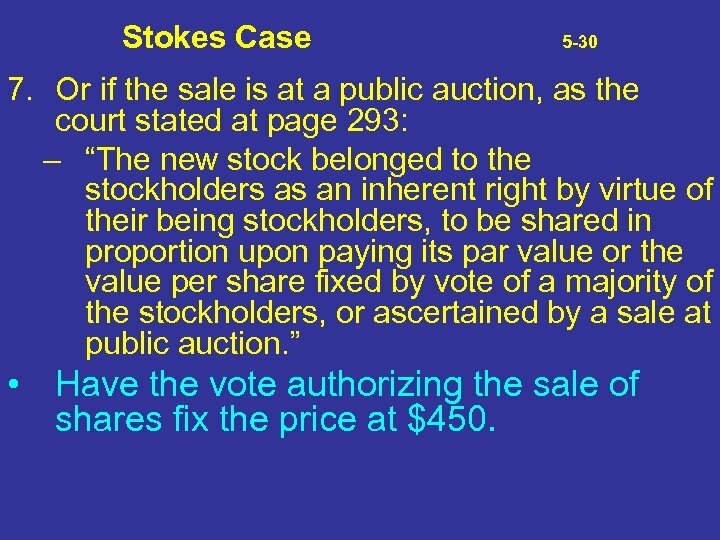 Or if the sale is at a public auction, as the court stated at page 293: – “The new stock belonged to the stockholders as an inherent right by virtue of their being stockholders, to be shared in proportion upon paying its par value or the value per share fixed by vote of a majority of the stockholders, or ascertained by a sale at public auction. 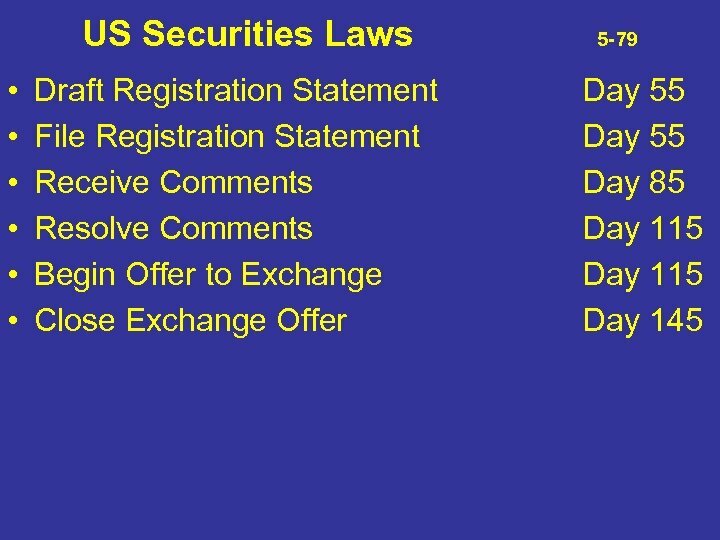 ” • Have the vote authorizing the sale of shares fix the price at $450. Quick Check Question 5. 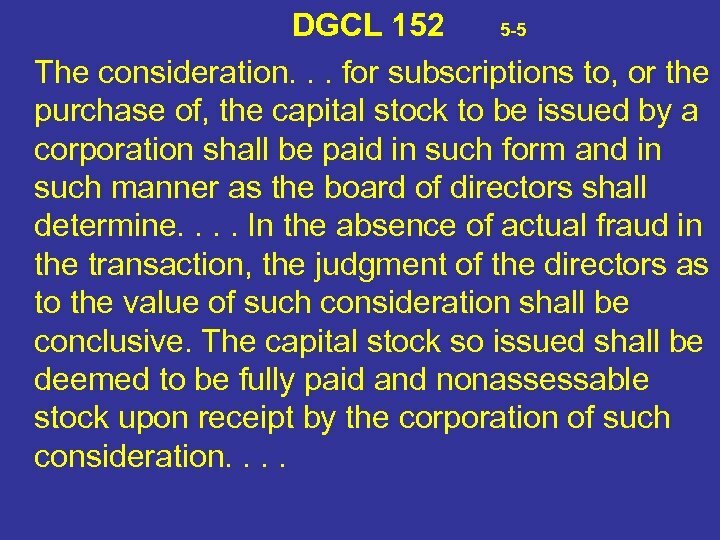 1 5 -31 How do RMBCA and DGCL deal with this issue of pre-emption? Quick Check Question 5. 1 5 -32 In the early 20 th century some statutes required preemptive rights unless the corporation opted out of them in its articles. RMBCA § 6. 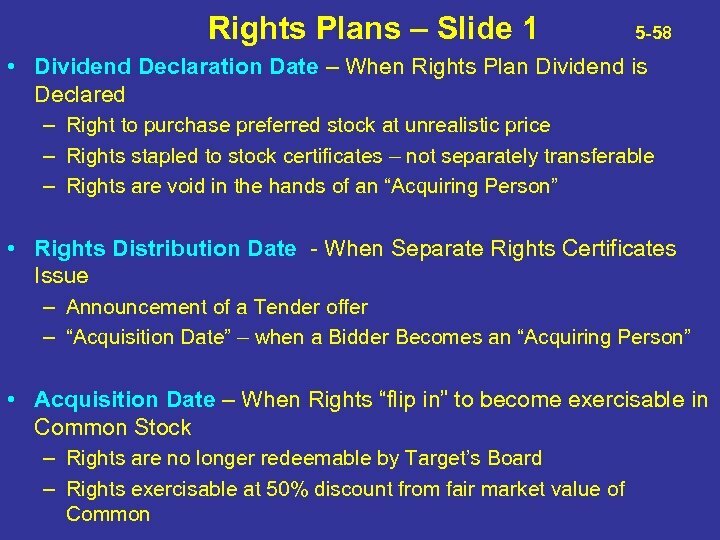 30: Shareholders’ Preemptive Rights • • 5 -33 – (a) The shareholders of a corporation do not have a preemptive right to acquire the corporation's unissued shares except to the extent the articles of incorporation so provide. – (b) A statement included in the articles of incorporation that “the corporation elects to have preemptive rights” (or words of similar import) means that the following principles apply except to the extent the articles of incorporation expressly provide otherwise. – (1) The shareholders of the corporation have a preemptive right, granted on uniform terms and conditions prescribed by the board of directors to provide a fair and reasonable opportunity to exercise the right, to acquire proportional amounts of the corporation's unissued shares upon the decision of the board of directors to issue them. – * * * – (3) There is no preemptive right with respect to: (i) Shares issued as compensation to directors, officers, agents, or employees of the corporation, its subsidiaries, or affiliates; (ii) Shares issued to satisfy conversion or option rights created to provide compensation to directors, officers, agents, or employees of the corporation, its subsidiaries, or affiliates; (iii) Shares authorized in articles of incorporation that are issued within six months from the effective date of incorporation; (iv) Shares sold otherwise than for money. RMBA § 6. 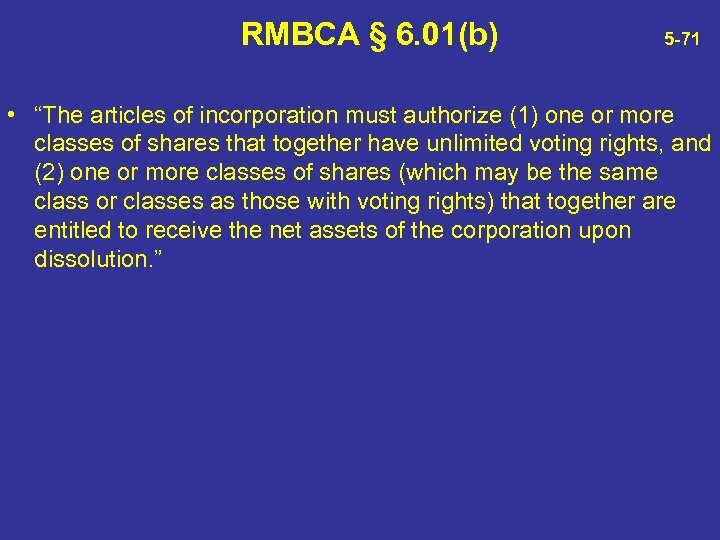 30 – Slide 2 • • • 5 -34 (4) Holders of shares of any class without general voting rights but with preferential rights to distributions or assets have no preemptive rights with respect to shares of any class. 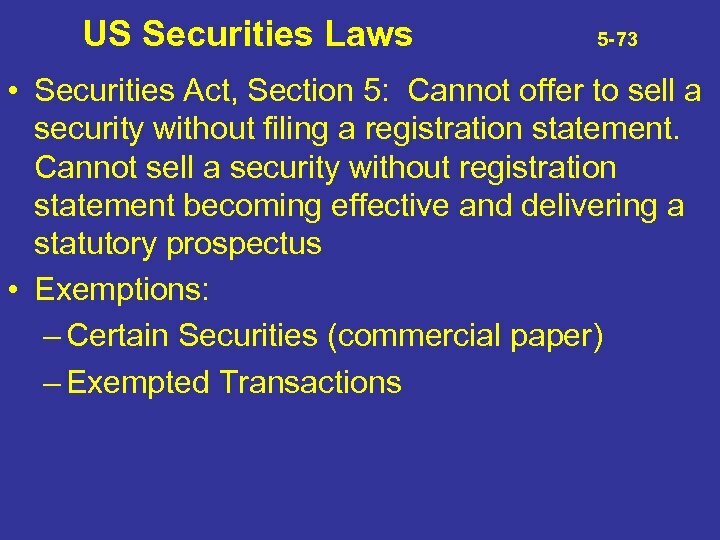 * * * (b ) A statement included in the articles of incorporation that “the corporation elects to have preemptive rights” (or words of similar import) means that the following principles apply except to the extent the articles of incorporation expressly provide otherwise. 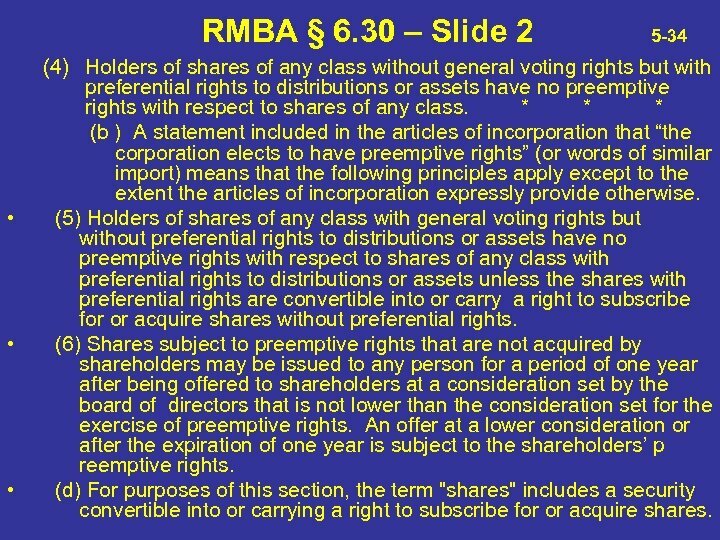 (5) Holders of shares of any class with general voting rights but without preferential rights to distributions or assets have no preemptive rights with respect to shares of any class with preferential rights to distributions or assets unless the shares with preferential rights are convertible into or carry a right to subscribe for or acquire shares without preferential rights. 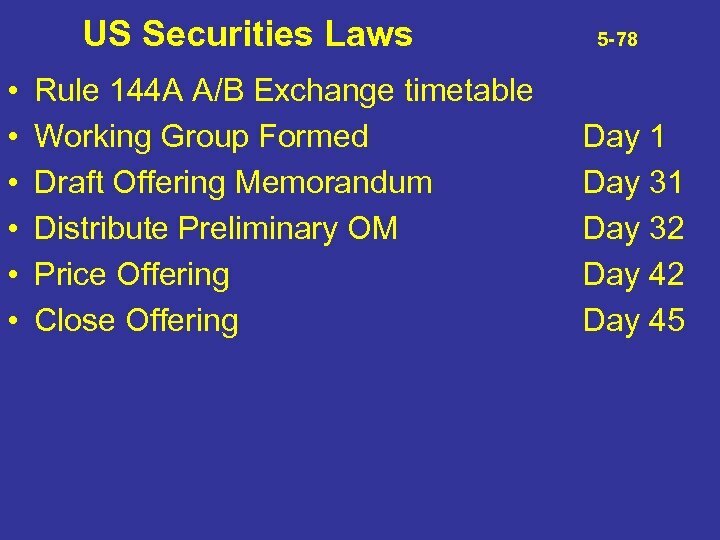 (6) Shares subject to preemptive rights that are not acquired by shareholders may be issued to any person for a period of one year after being offered to shareholders at a consideration set by the board of directors that is not lower than the consideration set for the exercise of preemptive rights. An offer at a lower consideration or after the expiration of one year is subject to the shareholders’ p reemptive rights. 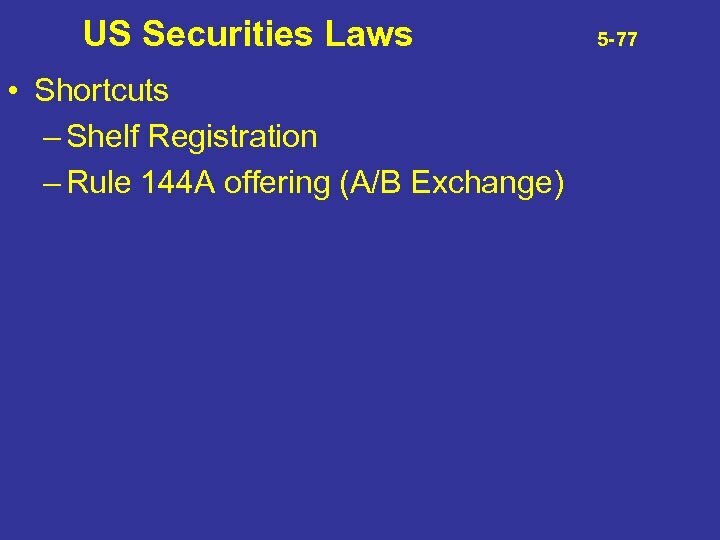 (d) For purposes of this section, the term "shares" includes a security convertible into or carrying a right to subscribe for or acquire shares. 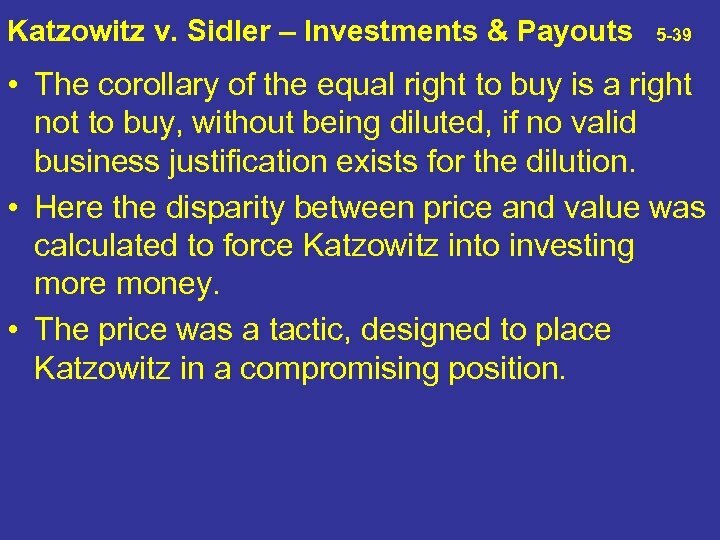 Katzowitz v. Sidler – Investments & Payouts 5 -39 • The corollary of the equal right to buy is a right not to buy, without being diluted, if no valid business justification exists for the dilution. • Here the disparity between price and value was calculated to force Katzowitz into investing more money. • The price was a tactic, designed to place Katzowitz in a compromising position. 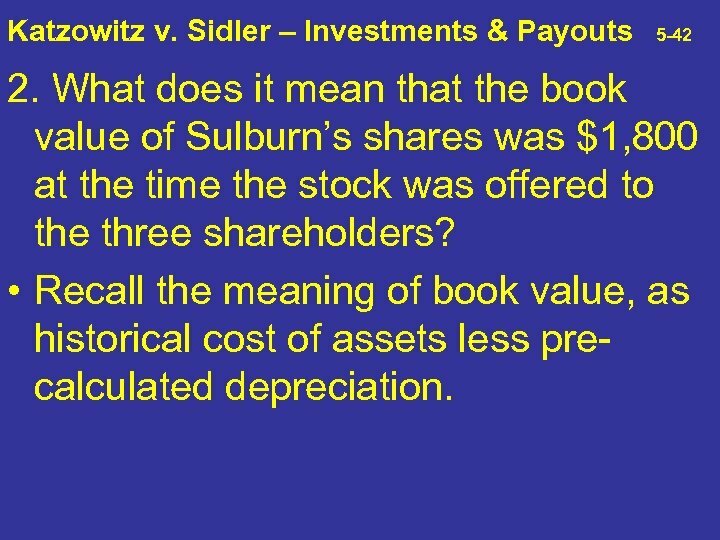 Katzowitz v. Sidler – Investments & Payouts 5 -40 1. 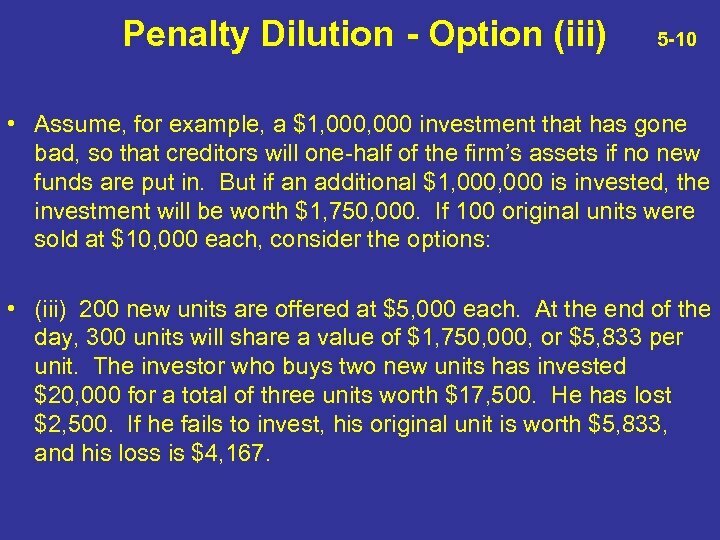 If you think of this as penalty dilution, could the defendants argue that the offer wasn’t unfair to Katzowitz? 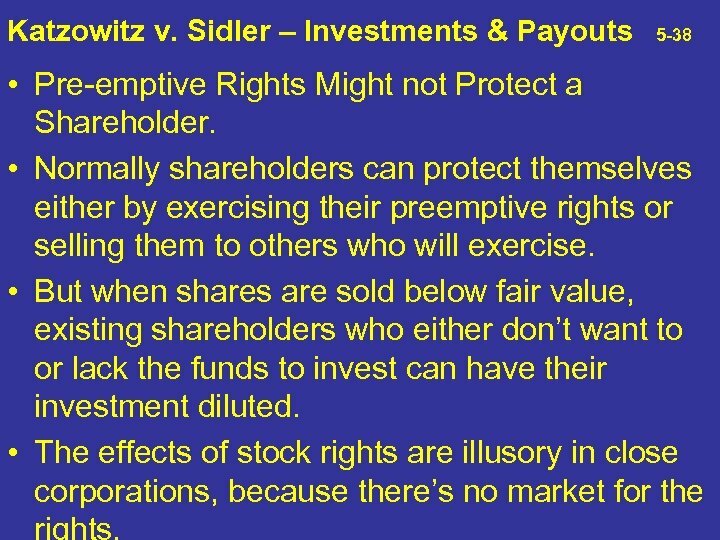 Katzowitz v. Sidler – Investments & Payouts 5 -41 1. If you think of this as penalty dilution, could the defendants argue that the offer wasn’t unfair to Katzowitz? 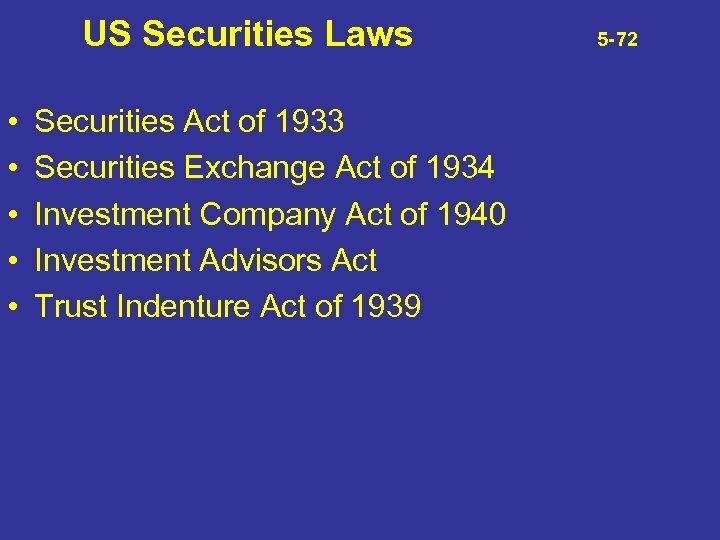 • Recall that penalty dilution is justified by forcing an investor to bear his share of a burden. • The business justification here was to loan the money to another corporation all of them controlled. • It’s hard to tell if this was an urgent decision, needed to salvage value for all of them, in which it was fair to ask Katzowitz to participate. 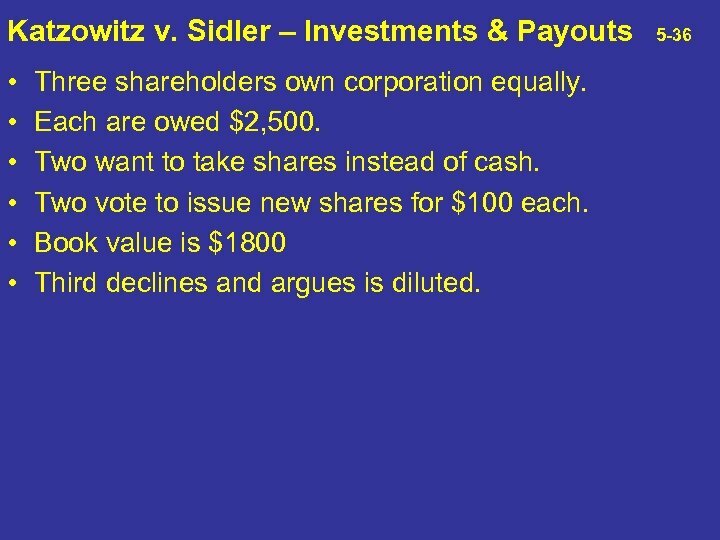 Katzowitz v. Sidler – Investments & Payouts 5 -42 2. 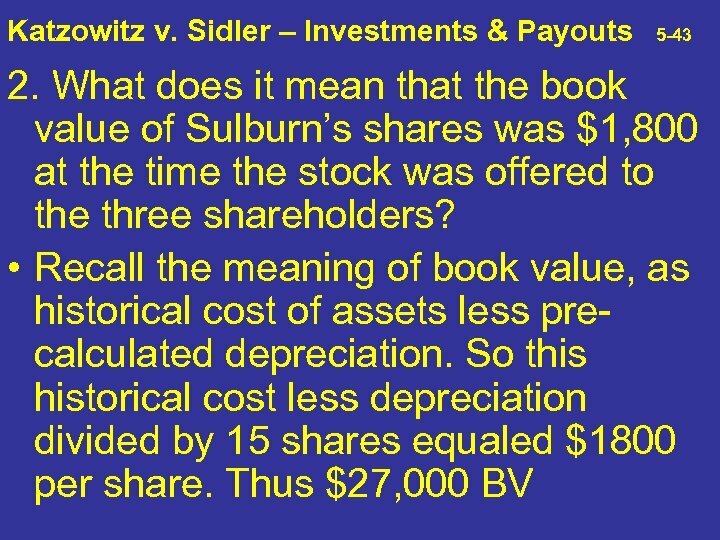 What does it mean that the book value of Sulburn’s shares was $1, 800 at the time the stock was offered to the three shareholders? • Recall the meaning of book value, as historical cost of assets less precalculated depreciation. 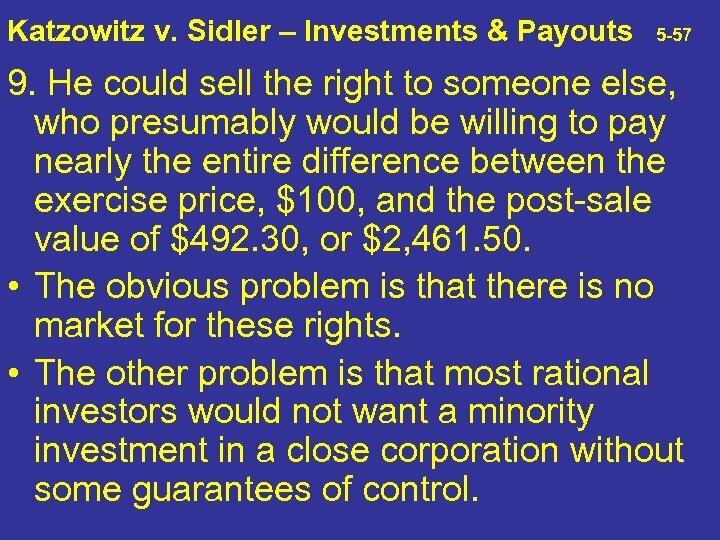 Katzowitz v. Sidler – Investments & Payouts 5 -44 3. 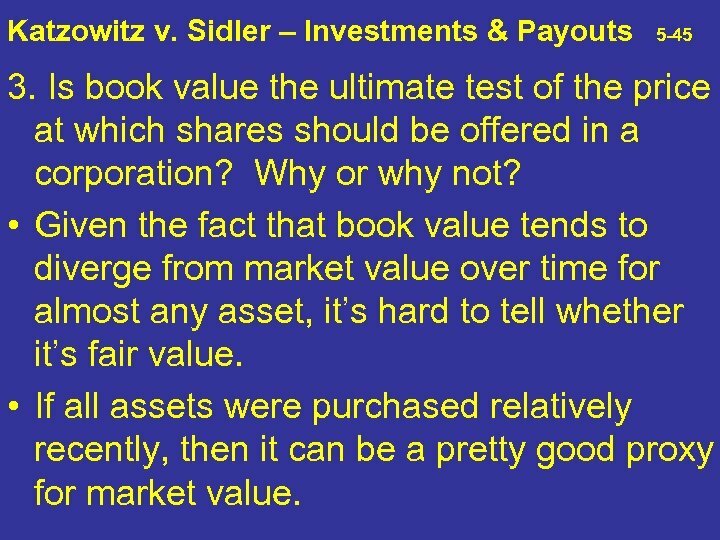 Is book value the ultimate test of the price at which shares should be offered in a corporation? Why or why not? 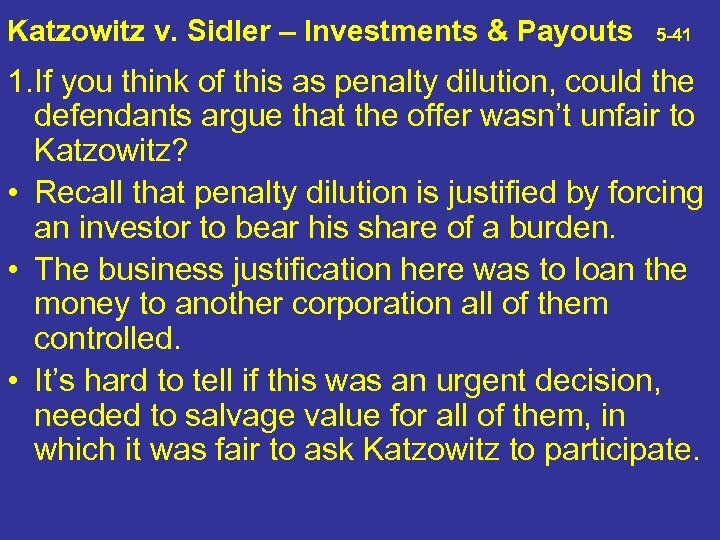 Katzowitz v. Sidler – Investments & Payouts 5 -45 3. 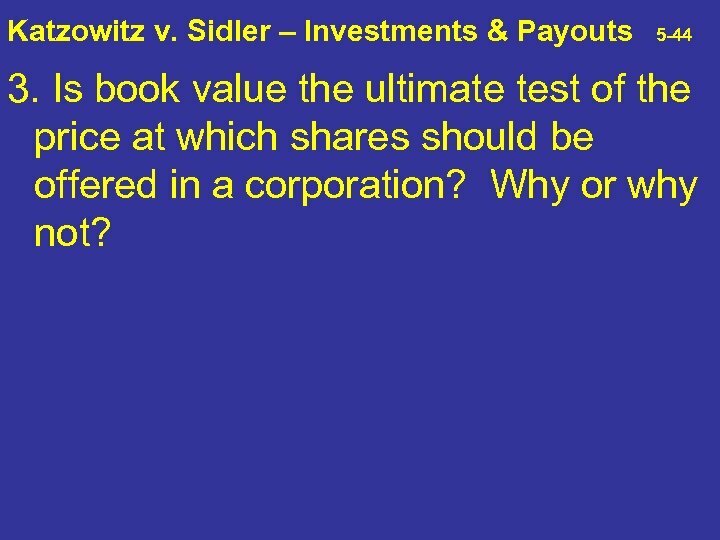 Is book value the ultimate test of the price at which shares should be offered in a corporation? Why or why not? • Given the fact that book value tends to diverge from market value over time for almost any asset, it’s hard to tell whether it’s fair value. • If all assets were purchased relatively recently, then it can be a pretty good proxy for market value. 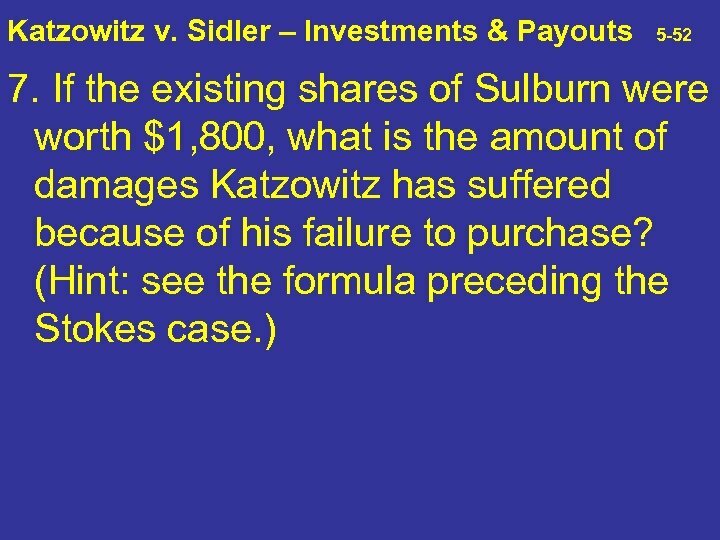 Katzowitz v. Sidler – Investments & Payouts 5 -46 4. 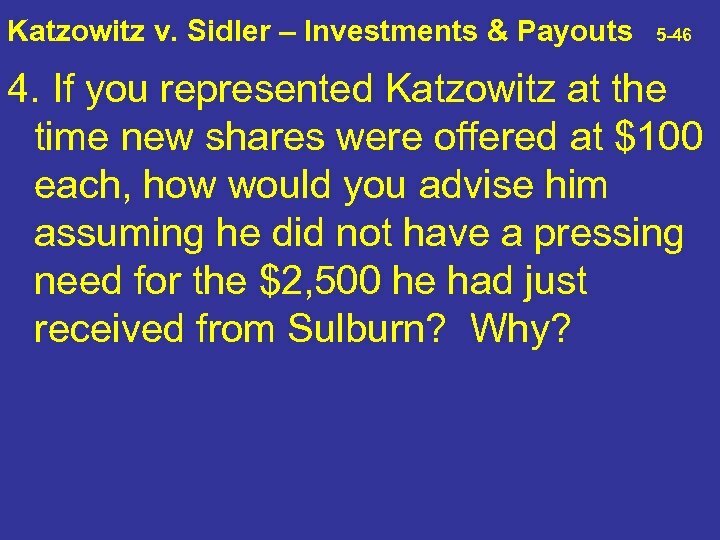 If you represented Katzowitz at the time new shares were offered at $100 each, how would you advise him assuming he did not have a pressing need for the $2, 500 he had just received from Sulburn? Why? 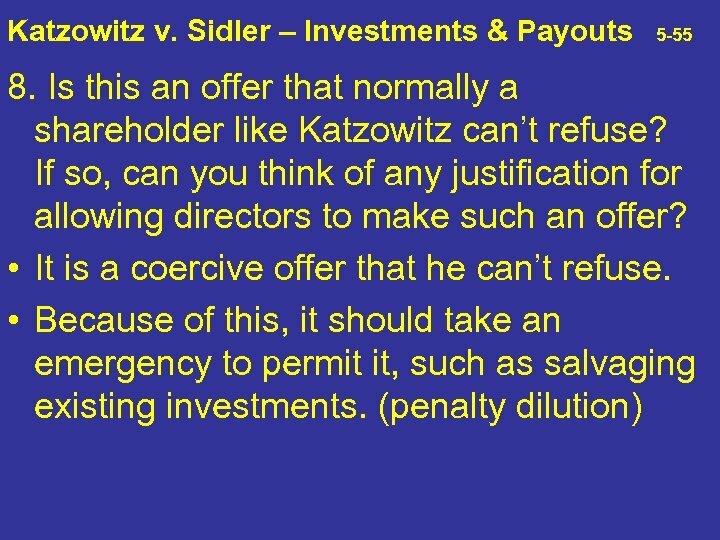 Katzowitz v. Sidler – Investments & Payouts 5 -47 4. 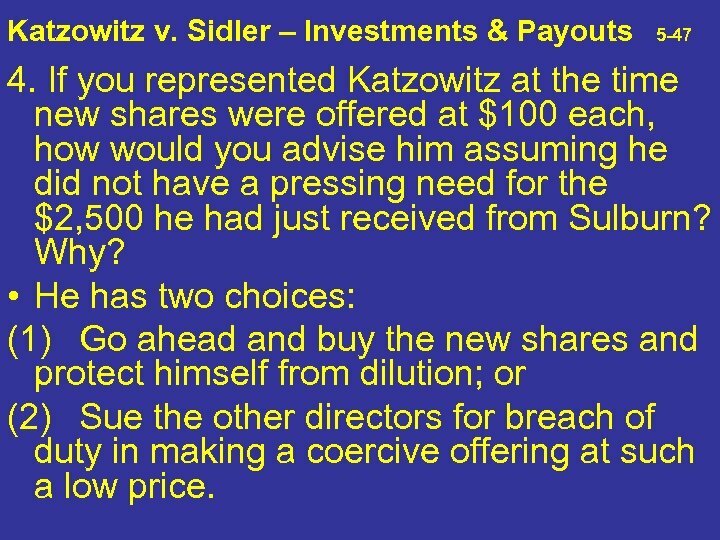 If you represented Katzowitz at the time new shares were offered at $100 each, how would you advise him assuming he did not have a pressing need for the $2, 500 he had just received from Sulburn? Why? • He has two choices: (1) Go ahead and buy the new shares and protect himself from dilution; or (2) Sue the other directors for breach of duty in making a coercive offering at such a low price. 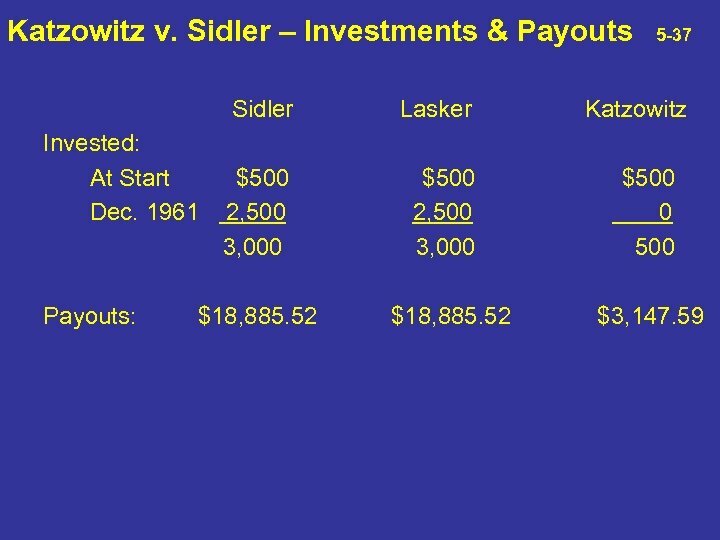 Katzowitz v. Sidler – Investments & Payouts 5 -48 5. The court states that preemptive rights were created by the courts to protect two distinct rights of shareholders - their equity in the corporation and their proportionate voting control. Which is more important here? 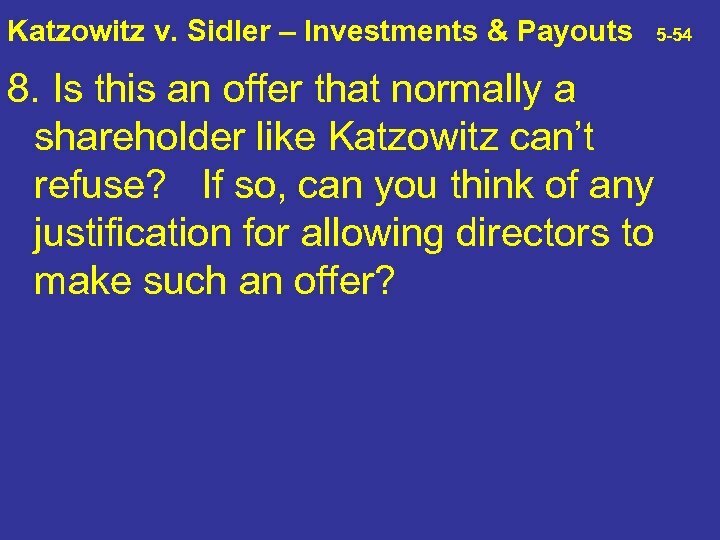 Katzowitz v. Sidler – Investments & Payouts 5 -49 5. 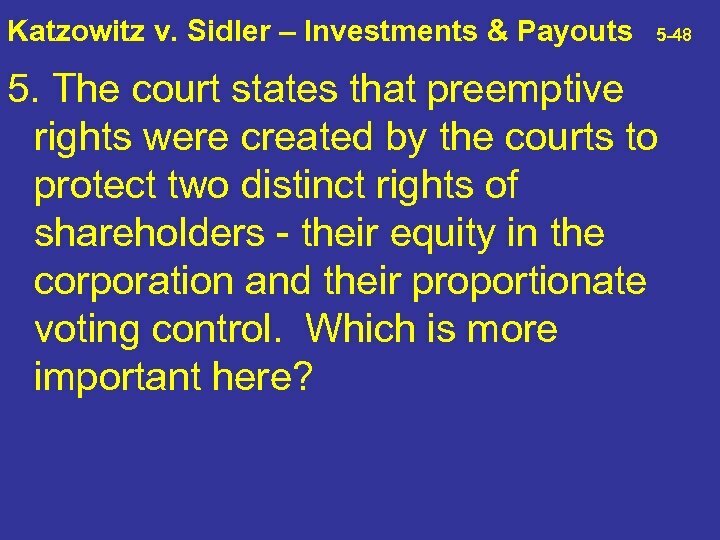 The court states that preemptive rights were created by the courts to protect two distinct rights of shareholders - their equity in the corporation and their proportionate voting control. Which is more important here? 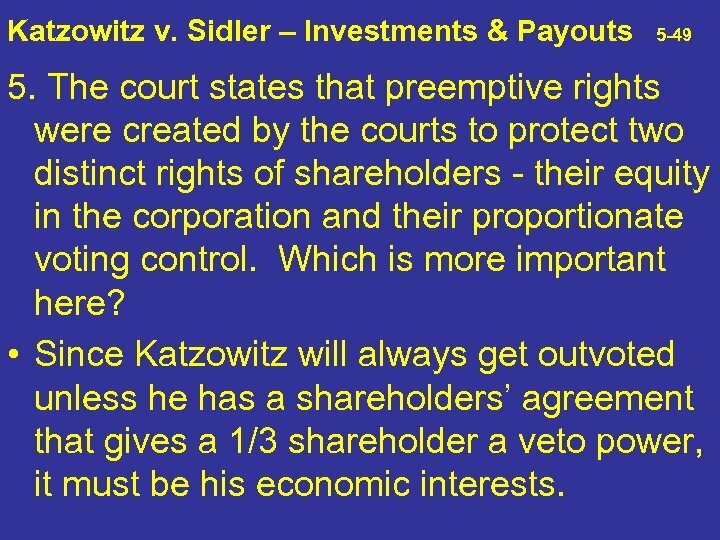 • Since Katzowitz will always get outvoted unless he has a shareholders’ agreement that gives a 1/3 shareholder a veto power, it must be his economic interests. 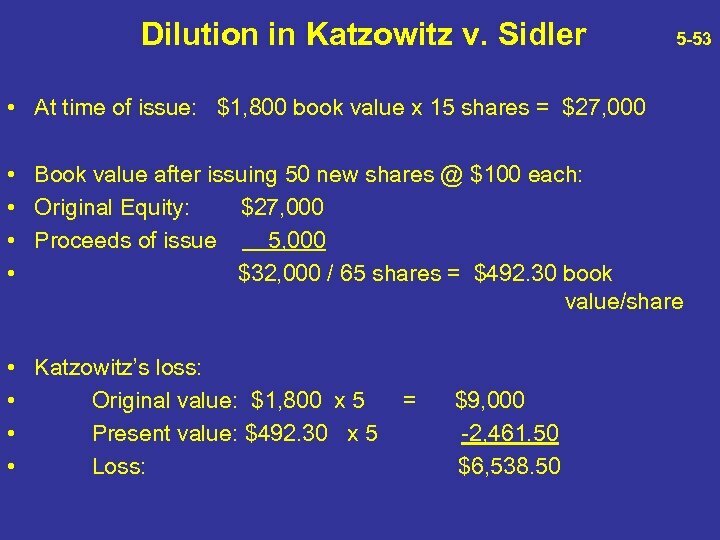 Katzowitz v. Sidler – Investments & Payouts 5 -50 6. If shares had been offered to each shareholder at $1, 800 per share, would Katzowitz have any complaint? 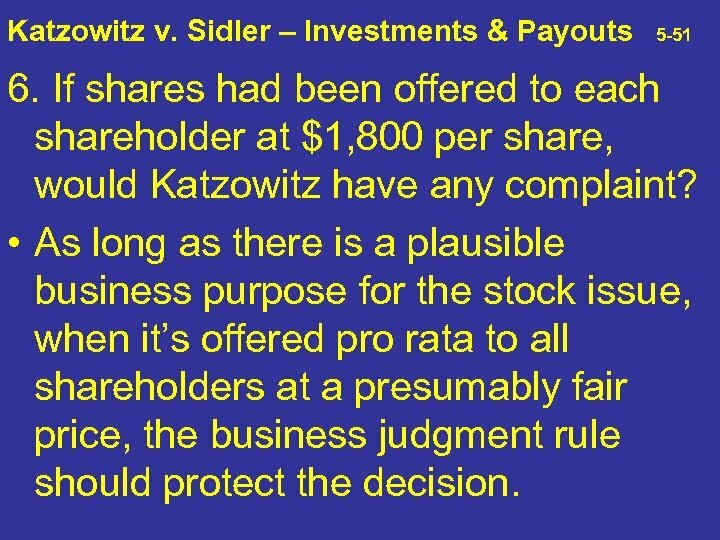 Katzowitz v. Sidler – Investments & Payouts 5 -51 6. If shares had been offered to each shareholder at $1, 800 per share, would Katzowitz have any complaint? 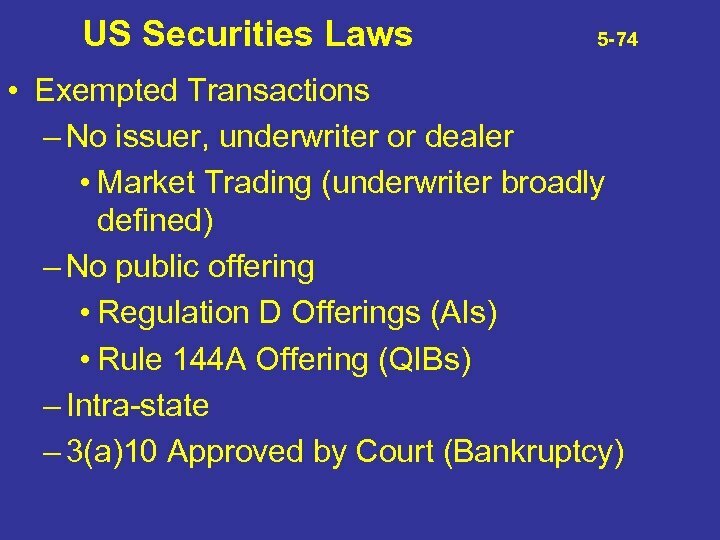 • As long as there is a plausible business purpose for the stock issue, when it’s offered pro rata to all shareholders at a presumably fair price, the business judgment rule should protect the decision. 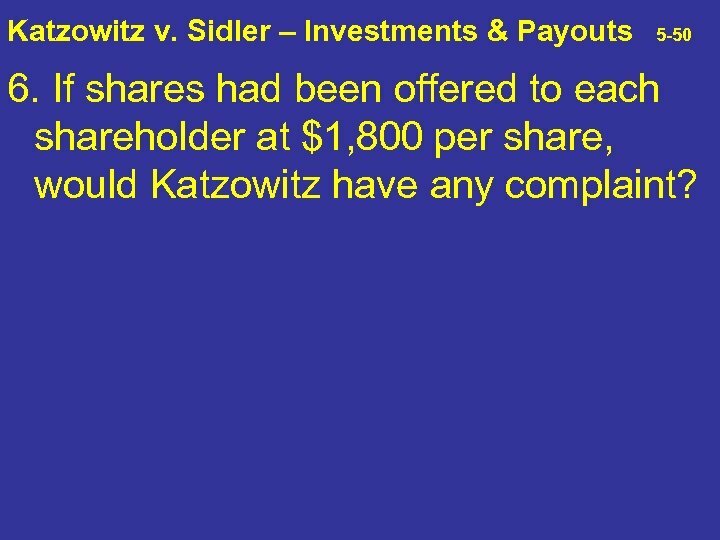 Katzowitz v. Sidler – Investments & Payouts 5 -56 9. 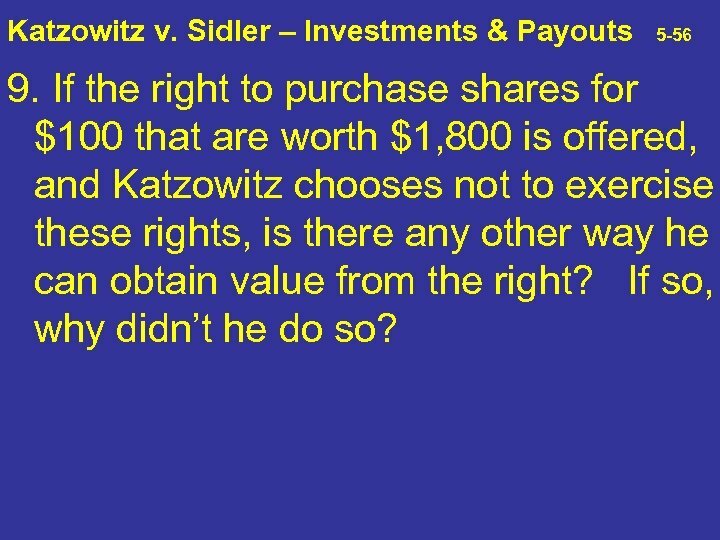 If the right to purchase shares for $100 that are worth $1, 800 is offered, and Katzowitz chooses not to exercise these rights, is there any other way he can obtain value from the right? If so, why didn’t he do so? 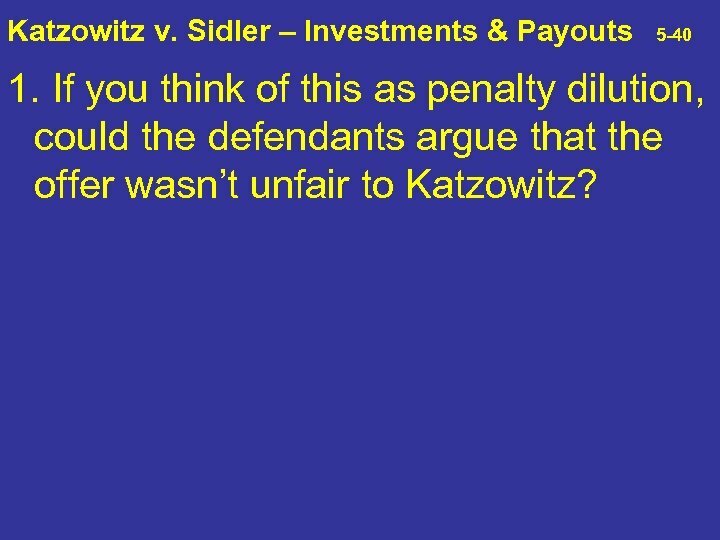 Katzowitz v. Sidler – Investments & Payouts 5 -57 9. He could sell the right to someone else, who presumably would be willing to pay nearly the entire difference between the exercise price, $100, and the post-sale value of $492. 30, or $2, 461. 50. • The obvious problem is that there is no market for these rights. • The other problem is that most rational investors would not want a minority investment in a close corporation without some guarantees of control. Del. G. C. L. Sec. 157 5 -61 • Subject to any provisions in the certificate of incorporation, every corporation may create and issue, whether or not in connection with the issue and sale of any shares of stock or other securities of the corporation, rights or options entitling the holders thereof to purchase from the corporation any shares of its capital stock of any class or classes, such rights or options to be evidenced by or in such instrument or instruments as shall be approved by the board of directors. 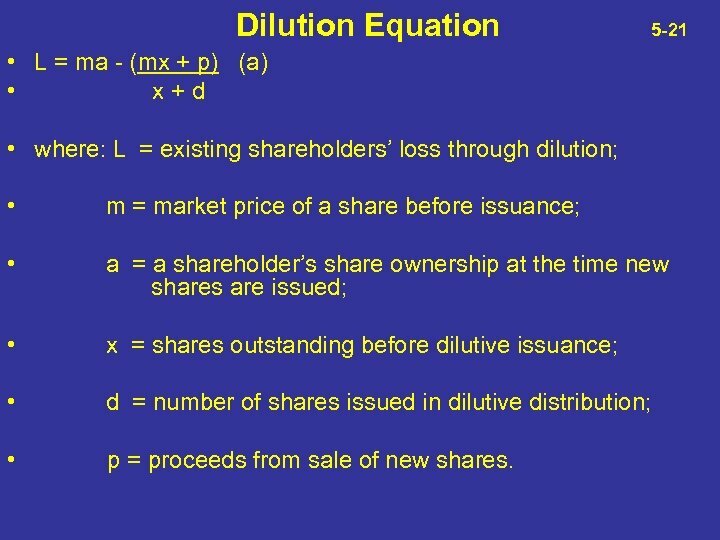 Dilution Equation 5 -62 • L = ma - (mx + p) (a) • x+d • where: L = existing shareholders’ loss through dilution; • m = market price of a share before issuance; • a = a shareholder’s share ownership at the time new shares are issued; • x = shares outstanding before dilutive issuance; • d = number of shares issued in dilutive distribution; • p = proceeds from sale of new shares. 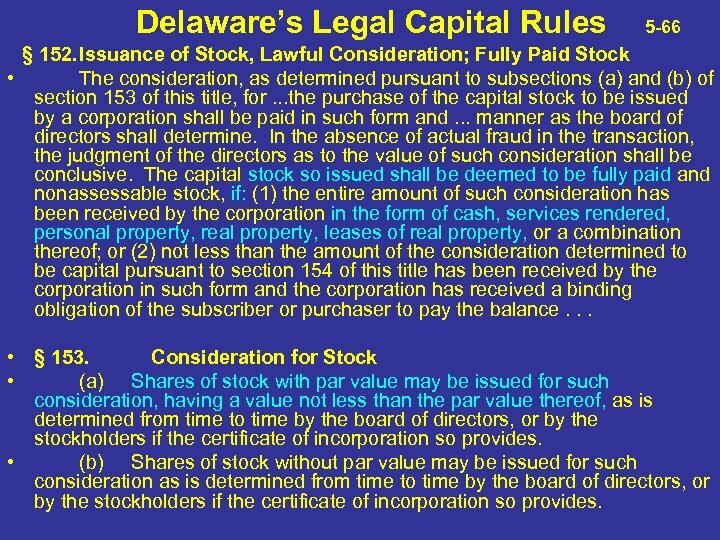 Delaware’s Legal Capital Rules 5 -66 § 152. 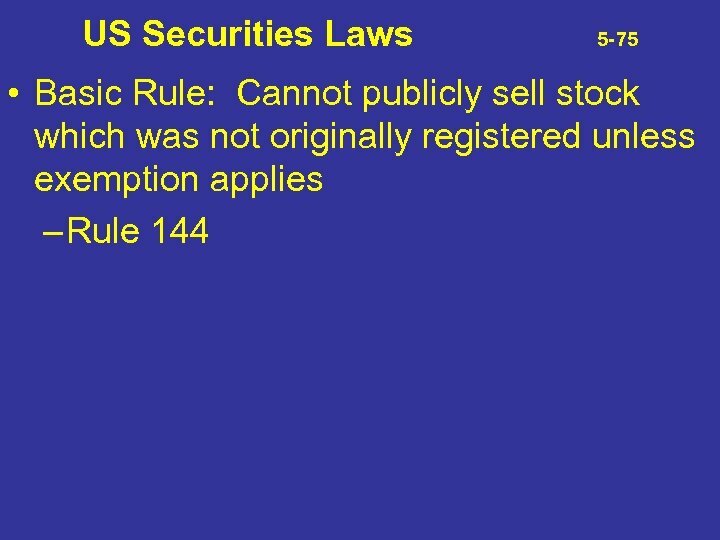 Issuance of Stock, Lawful Consideration; Fully Paid Stock • The consideration, as determined pursuant to subsections (a) and (b) of section 153 of this title, for. . . the purchase of the capital stock to be issued by a corporation shall be paid in such form and. . . manner as the board of directors shall determine. In the absence of actual fraud in the transaction, the judgment of the directors as to the value of such consideration shall be conclusive. 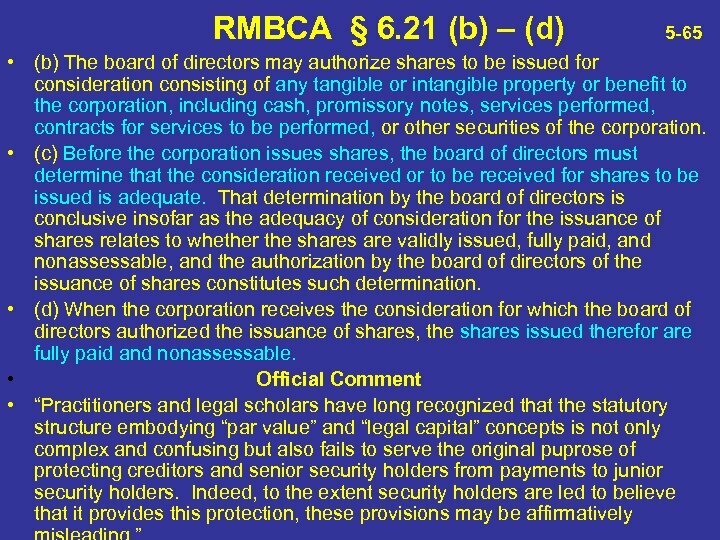 The capital stock so issued shall be deemed to be fully paid and nonassessable stock, if: (1) the entire amount of such consideration has been received by the corporation in the form of cash, services rendered, personal property, real property, leases of real property, or a combination thereof; or (2) not less than the amount of the consideration determined to be capital pursuant to section 154 of this title has been received by the corporation in such form and the corporation has received a binding obligation of the subscriber or purchaser to pay the balance. . . • § 153. 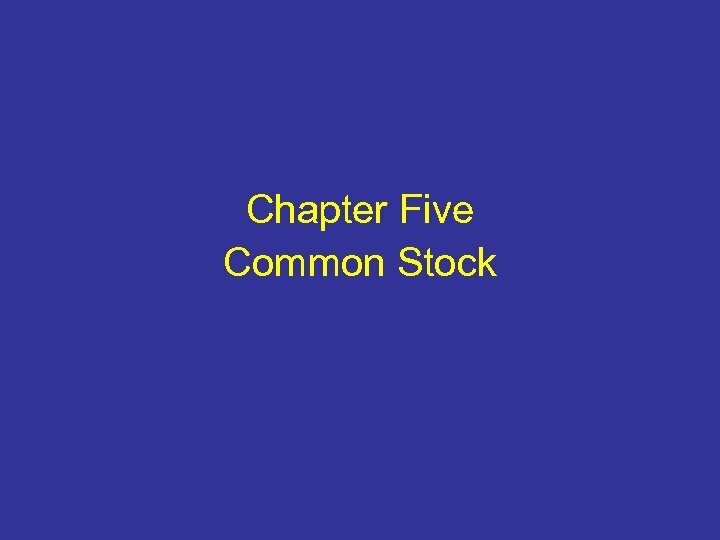 Consideration for Stock • (a) Shares of stock with par value may be issued for such consideration, having a value not less than the par value thereof, as is determined from time to time by the board of directors, or by the stockholders if the certificate of incorporation so provides. 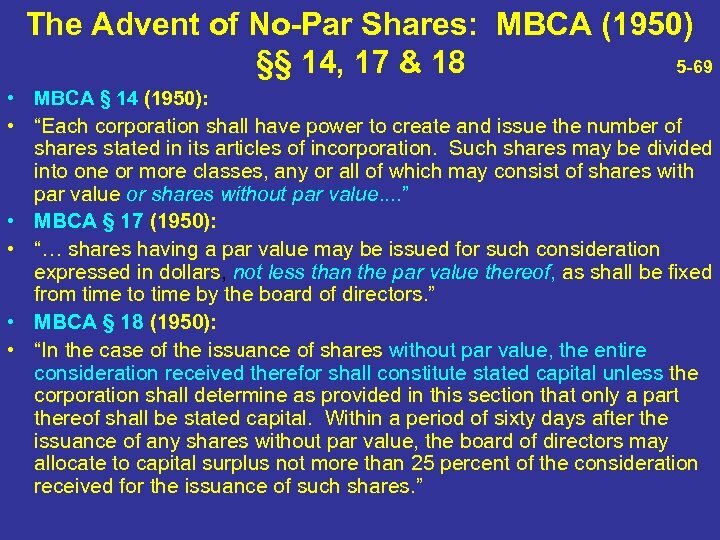 • (b) Shares of stock without par value may be issued for such consideration as is determined from time to time by the board of directors, or by the stockholders if the certificate of incorporation so provides. 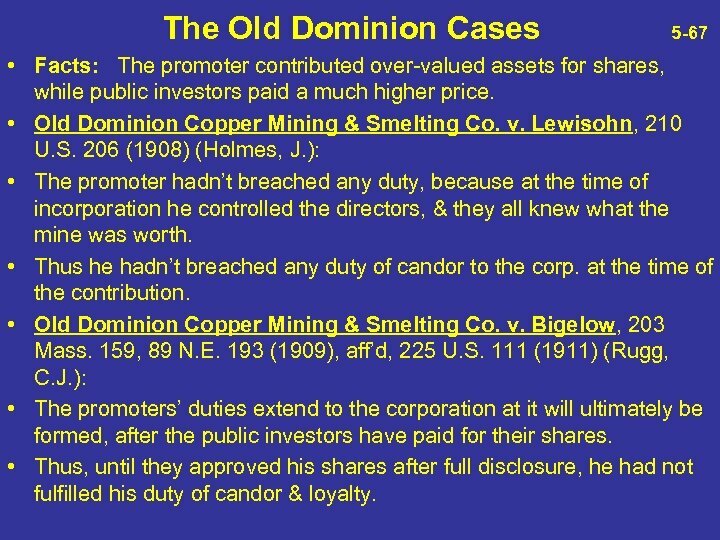 The Old Dominion Cases 5 -67 • Facts: The promoter contributed over-valued assets for shares, while public investors paid a much higher price. • Old Dominion Copper Mining & Smelting Co. v. Lewisohn, 210 U. S. 206 (1908) (Holmes, J. ): • The promoter hadn’t breached any duty, because at the time of incorporation he controlled the directors, & they all knew what the mine was worth. • Thus he hadn’t breached any duty of candor to the corp. at the time of the contribution. • Old Dominion Copper Mining & Smelting Co. v. Bigelow, 203 Mass. 159, 89 N. E. 193 (1909), aff’d, 225 U. S. 111 (1911) (Rugg, C. J. 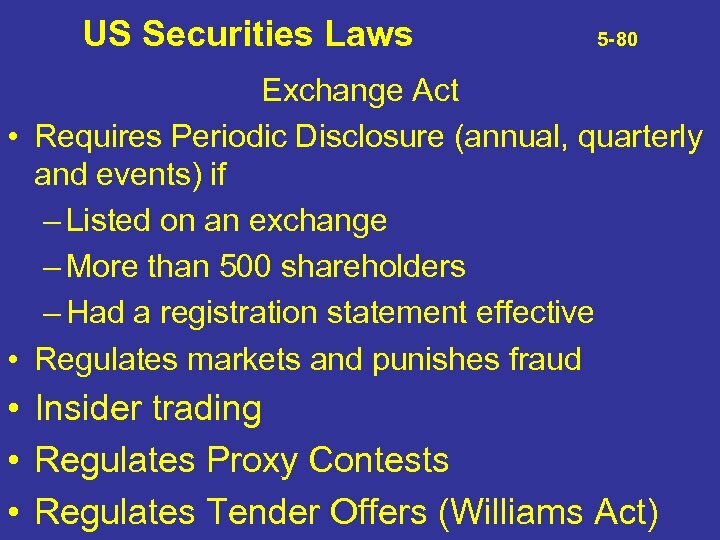 ): • The promoters’ duties extend to the corporation at it will ultimately be formed, after the public investors have paid for their shares. • Thus, until they approved his shares after full disclosure, he had not fulfilled his duty of candor & loyalty. RMBCA § 6. 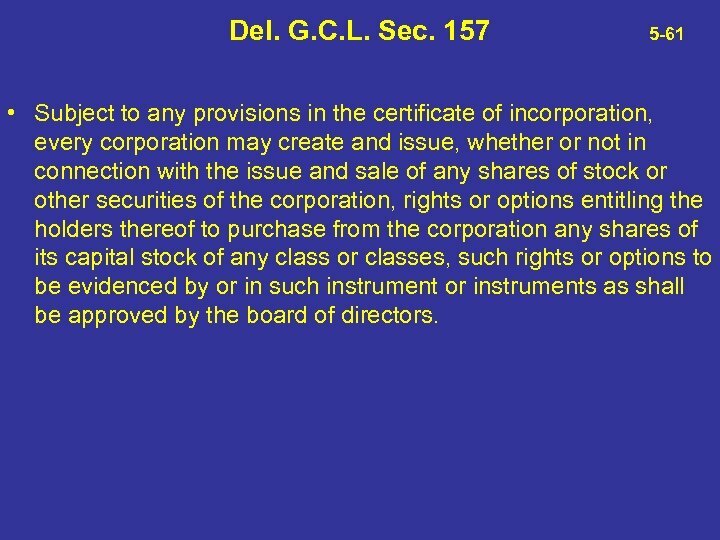 22 5 -68 (a) A purchaser from a corporation of its own shares is not liable to the corporation or its creditors with respect to the shares except to pay the consideration for which the shares were authorized to be issued (section 6. 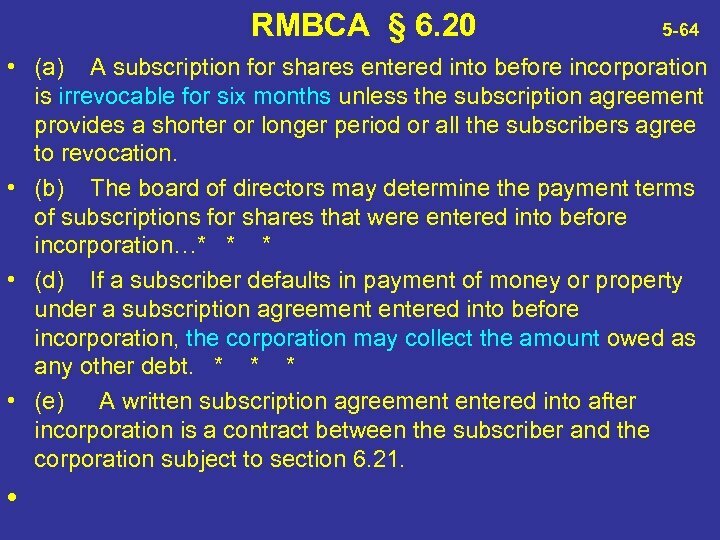 21) or specified in the subscription agreement (section 6. 20). 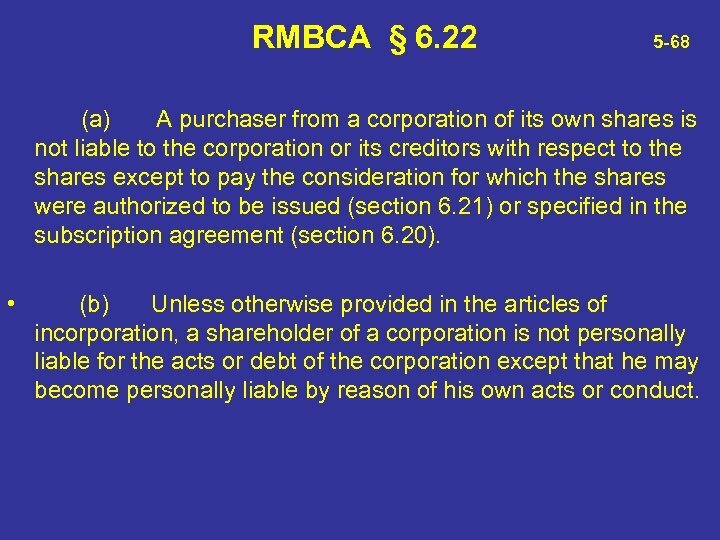 • (b) Unless otherwise provided in the articles of incorporation, a shareholder of a corporation is not personally liable for the acts or debt of the corporation except that he may become personally liable by reason of his own acts or conduct. Del. G. C. L. § 154 5 -70 • § 154. 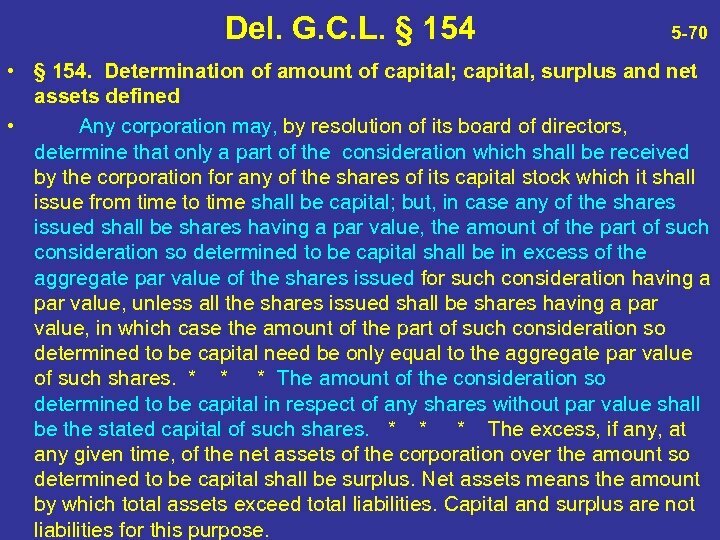 Determination of amount of capital; capital, surplus and net assets defined • Any corporation may, by resolution of its board of directors, determine that only a part of the consideration which shall be received by the corporation for any of the shares of its capital stock which it shall issue from time to time shall be capital; but, in case any of the shares issued shall be shares having a par value, the amount of the part of such consideration so determined to be capital shall be in excess of the aggregate par value of the shares issued for such consideration having a par value, unless all the shares issued shall be shares having a par value, in which case the amount of the part of such consideration so determined to be capital need be only equal to the aggregate par value of such shares. 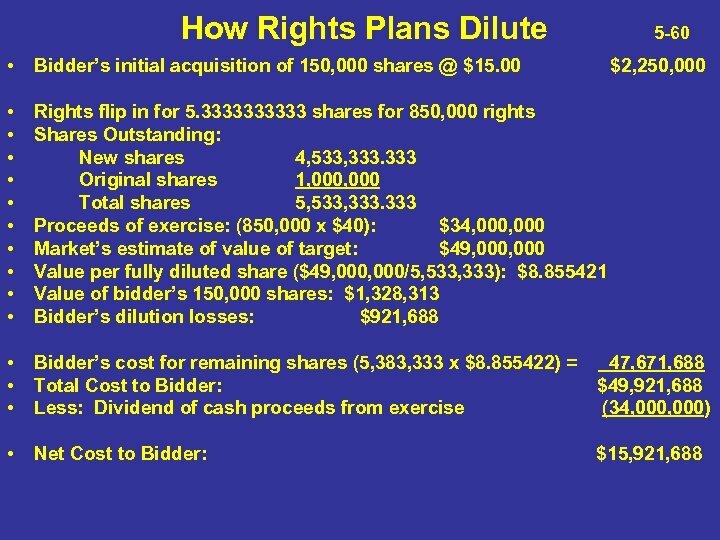 * * * The amount of the consideration so determined to be capital in respect of any shares without par value shall be the stated capital of such shares. * * * The excess, if any, at any given time, of the net assets of the corporation over the amount so determined to be capital shall be surplus. Net assets means the amount by which total assets exceed total liabilities. Capital and surplus are not liabilities for this purpose.